A new railway operating plan starting from April 10 has increased the country's passenger and freight train capacity, according the national railway operator. 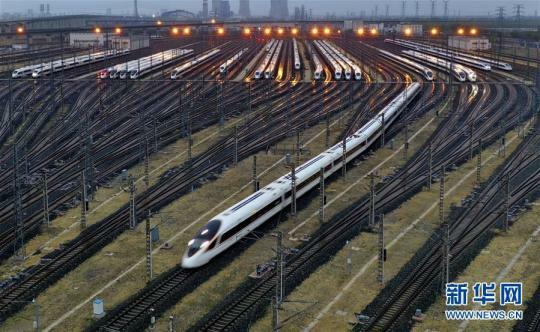 Under the new plan, Fuxing bullet trains will operate between Beijing and Qingdao in East China's Shandong province, cutting travel time between the two cities to within 3 hours, 49 minutes less than before. The running time of high-speed trains between Beijing and Lanzhou, capital of Northwest China's Gansu province, will also shorten to about 7.5 hours, compared to more than 8 hours previously. Lanzhou and Chengdu, capital of Southwest China's Sichuan province, will be connected by bullet trains for the first time, with the travel time to decrease to about 6 hours and 50 minutes, about 5 hours less than before. In addition, 1,203 pairs of normal-speed trains are now operating nationwide, with 81 pairs of public welfare slow trains continuing to operate, to meet the diverse needs of passengers.